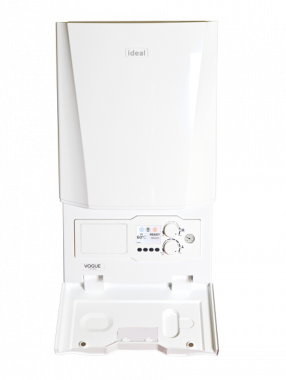 The Vogue Gen2 S18 gas boiler is a condensing and wall mounted unit which is manufactured by Ideal. It is a system boiler which means it directly heats your central heating system and produces hot water for a storage cylinder. Most of the important parts of the hot water and heating system, such as the pump and expansion vessel, are built included within a system boiler making it quicker and simpler to install. This also means you get a faster response to demand for heating and hot water and you don't need to have a feed and expansion tank in the loft. This unit is a highly reliable boiler with an efficiency rating of 89.4% making it B rated. It has an output rating of 18kW making the unit perfect if you live in a slightly smaller home with only one bathroom. It includes a variety of features and premium components such as multi-function buttons for simplified operation, an easy to read pressure gauge, a uniform control opening, cool door technology, stylish aesthetics with full size door complete with damped opening, up to 7:1 modulation and a stainless steel heat exchanger. All these features combined make it a highly reliable boiler. This boiler has a low lift weight from 30.7kg which is up to 2.6kg lighter than previous models and is a single piece unit, helping to save you time and money on the installation. It also features a backlit 3.5 LCD full colour display helping to give you maximum control over the unit. The boiler comes with 8 years warranty on parts and labour as standard helping to give you peace of mind that you have bought a highly reliable unit.